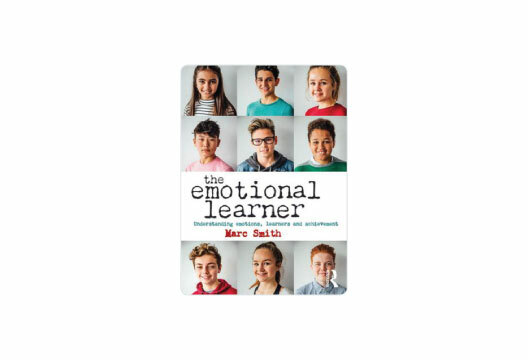 The Emotional Learner: Understanding Emotions, Learning and Achievement by Marc Smith (Routledge; Pb £22.99), reviewed by Mary Prest. Marc Smith provides a thoughtful and methodical summary of the research evidence relating to how we define emotions and how they impact on learning. He makes the case that the ‘cognitive and emotional brain networks are intricately linked’, based on both physiological and psychological theory and evidence. The Emotional Learner is also part practical guide; it provides a powerful argument that educators should develop their understanding of these links and concludes by offering practical suggestions about what can be done to support learning more effectively. The book will resonate with educators (including parents) everywhere. I recognised the challenges Smith identifies as he refers to anecdotal evidence from his life as a teacher alongside the research evidence. Written in a conversational, easy-to-access style, the book reflects on and draws together a comprehensive body of research. Smith develops and evidences a message that encourages educators to move away from the simplistic view that learning is all about development of cognitive processes, to one where they understand that learning is also about development of emotional and social processes – and that these three strands are inextricably interdependent. Smith challenges the concept of negative and positive emotions, categorising them instead as ‘activating’ or ‘de-activating’, and considers context as a critical factor. He draws on education theories that will be familiar to most teachers, including Vygotsky’s zone of proximal development and Deci and Ryan’s self-determination theory. He considers the emotional impact of the current education system and discusses issues such as boredom and challenge, learned helplessness vs. mastery, anxiety, personality and motivation, self-determination, interest and curiosity, self-esteem and educational self-concept. There’s room for a special chapter on teenagers, arguing that their brains are uniquely emotional and that they therefore deserve particular consideration. The book is clearly structured with each chapter considering perspectives on different emotional strands. There are handy end-of-chapter summaries, drawing together the main points that have been discussed and evidenced, and offering information about further reading, which makes it easy to pursue any specific interests. Smith asserts that ‘most school teachers aren’t researchers and have to rely on others to guide them towards what works and what doesn’t’. They could do a lot worse than be guided by this interesting and thought-provoking book; it should be high on the reading list of every teacher training course.